When it’s getting this close to Christmas, work is getting a bit hectic and I don’t necessarily have time to take on big craft projects. But you can get a seasonal feel without expending too much effort. 1. Place some whole dried oranges in a bowl. 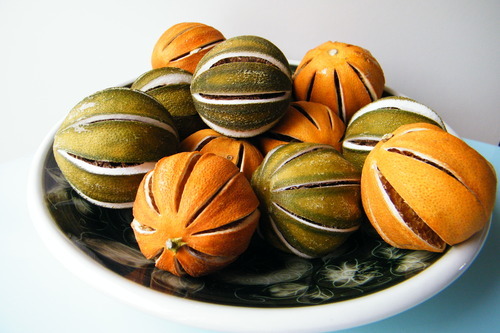 As well as looking festive, they also have a subtle marmalade aroma. These are readily available online if you don’t fancy making your own. 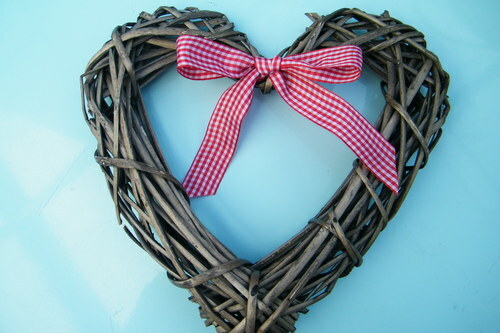 Many wicker, rattan and willow wreaths are just as attractive unadorned. This heart wreath has been decorated with a single ribbon in Christmas colours. Bring nature inside and cluster together some pine cones in bowls, on shelves or around a fireplace. Leave them natural or paint in Christmassy colours. L-R in image below: giant gold pine cones; cinnamon pine cones; large pine cones in natural, white, champagne gold, silver or copper colour.